Truly the mainstay of what we all do is to provide housing services in one form or another, but typically this means that we are owners of housing units designated for people with developmental disabilities. In the typical affordable housing model tenants pay only 30% of their income as rent which can amount to about $250 to $350 per month. Compared to typical rents in the area this is a significant savings on the cost of housing. Many of the LHA members own units either in separate homes or buildings, or as units within larger developments. The sizes of the homes throughout the state can range anywhere from one unit to fiftenn units or even more. Generally if a person requires in-home services these are provided by a different agency. Most tenants lives independently, potentially with housemates. In this model of housing, typically seen as the solution to moving individuals from a State Development Center or for those individuals who need a higher-level of care, the LHA member organization will own a home which will then be leased to a licensed service provider who will then provide 24/7 care and supervision in the home. The supports are paid for by the resident's SSI and Medi-Cal and the Regional Center. There are hundreds of these homes throughout the state and they were integral in being able to provide enough housing capacity in the community in order to close the State Developmental Centers. 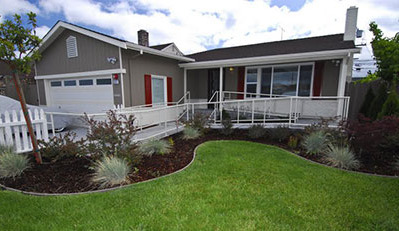 Generally these homes are made accessible to people in wheelchairs and may include additional safety features including delayed egress. These housing models come in all shapes and sizes and can range from 3 to 5 people per home. These homes allow residents to truly grow as individuals as they integrate into the larger local community and have access to all of the supports and services provided to the general public. Most members provide some form of property management services: on the homes they own or perhaps to outside agencies who own homes or even for families who own the home where their loved one is receiving care. Property management services include long-term asset management, routine and emergency maintenance, landscaping, accessibility and other person-centered modifications, occupied remodeling, and refinancing. This service is particularly great for service providers and families as it allows them to focus on providing care, and not all of the details involved in maintaining a home. Many member agencies provide services which help people with developmental disabilities to find affordable housing in their local areas. These agencies work with government housing agencies to monitor and obtain Section 8 vouchers or they might work with developers to obtain units in large apartment complexes which are set-aside for people with developmental disabilities. A newer and more specialized program which includes some of the services listed above is the Legacy Homes program. The Legacy Homes program allows families a way to provide for the housing needs of their loved one well into the future. Click here for more detailed information.